Pr e s by te r i a n s To d ay | OCTOBER/NOVEMBER 2017 17 our call as God's people. We must gather and talk if we are to begin to dismantle the structures that accord race such power. And it is the church that must take the lead. The Confession of Belhar declares: We believe • that God has entrusted the church with the message of rec- onciliation in and through Jesus Christ; … • that the credibility of this message is seriously affected and its beneficial work obstructed when it is proclaimed in a land which professes to be Christian, but in which the enforced separa- tion of people on a racial basis promotes and perpetuates alien- ation, hatred and enmity. The hard of work of engaging in conversation about race begins with each of us. 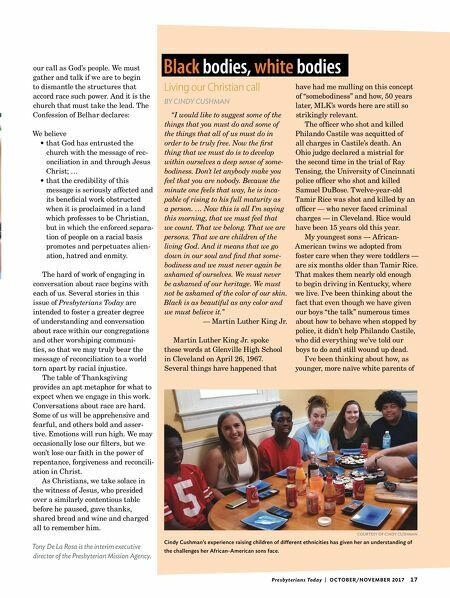 Several stories in this issue of Presbyterians Today are intended to foster a greater degree of understanding and conversation about race within our congregations and other worshiping communi- ties, so that we may truly bear the message of reconciliation to a world torn apart by racial injustice. The table of Thanksgiving provides an apt metaphor for what to expect when we engage in this work. Conversations about race are hard. Some of us will be apprehensive and fearful, and others bold and asser- tive. Emotions will run high. We may occasionally lose our filters, but we won't lose our faith in the power of repentance, forgiveness and reconcili- ation in Christ. As Christians, we take solace in the witness of Jesus, who presided over a similarly contentious table before he paused, gave thanks, shared bread and wine and charged all to remember him. Tony De La Rosa is the interim executive director of the Presbyterian Mission Agency. Living our Christian call BY CINDY CUSHMAN "I would like to suggest some of the things that you must do and some of the things that all of us must do in order to be truly free. Now the first thing that we must do is to develop within ourselves a deep sense of some- bodiness. Don't let anybody make you feel that you are nobody. Because the minute one feels that way, he is inca- pable of rising to his full maturity as a person. … Now this is all I'm saying this morning, that we must feel that we count. That we belong. That we are persons. That we are children of the living God. And it means that we go down in our soul and find that some- bodiness and we must never again be ashamed of ourselves. We must never be ashamed of our heritage. We must not be ashamed of the color of our skin. Black is as beautiful as any color and we must believe it." — Martin Luther King Jr. Martin Luther King Jr. spoke these words at Glenville High School in Cleveland on April 26, 1967. Several things have happened that have had me mulling on this concept of "somebodiness" and how, 50 years later, MLK's words here are still so strikingly relevant. The officer who shot and killed Philando Castile was acquitted of all charges in Castile's death. An Ohio judge declared a mistrial for the second time in the trial of Ray Tensing, the University of Cincinnati police officer who shot and killed Samuel DuBose. Twelve-year-old Tamir Rice was shot and killed by an officer — who never faced criminal charges — in Cleveland. Rice would have been 15 years old this year. My youngest sons — African- American twins we adopted from foster care when they were toddlers — are six months older than Tamir Rice. That makes them nearly old enough to begin driving in Kentucky, where we live. I've been thinking about the fact that even though we have given our boys "the talk" numerous times about how to behave when stopped by police, it didn't help Philando Castile, who did everything we've told our boys to do and still wound up dead. I've been thinking about how, as younger, more naïve white parents of Black bodies, white bodies COURTESY OF CINDY CUSHMAN Cindy Cushman's experience raising children of different ethnicities has given her an understanding of the challenges her African-American sons face.